When it comes to picking a college, academics, athletics, and extracurricular activities all play an essential role, but the appearance and feel of a campus attracts students too. Over the course of four years, undergraduates cross campus thousands of times, reading books on the quad, meeting outside the library, and soaking up the atmosphere. A beautiful campus ties a college to its community, bringing in visitors and attracting tourists. 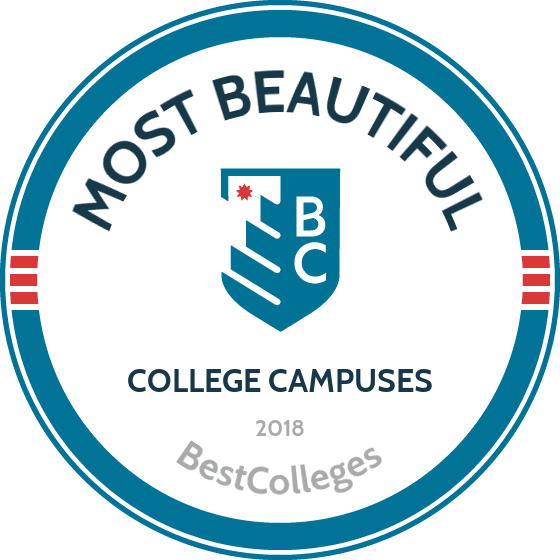 Oxford and Cambridge inspired an entire architectural style known as collegiate Gothic, but the classical college look coupled with natural beauty, stunning views, and lush gardens also shape the feel of a campus. Some students prefer a more modern or urban style found on newer campuses. Our list of the most beautiful college campuses includes modern and classical stylings. To create this list, we examined college location, styles of architecture seen on campus, and whether the campus includes any famous landmarks. When considering location, we placed less value on convenience and more value on scenic locales. Many of the colleges on this list attract more than just students to their campuses and were designed by famous architects, which help them stand out. Some campus landmarks bring in tourists and add to the beauty of the school. Located on the shores of Lake Michigan in Chicago’s South Side, the University of Chicago spans 211 acres in the Hyde Park and Woodlawn neighborhoods. Classical Gothic architecture dominates the campus, and world-renown architects like Frank Lloyd Wright, Ludwig Mies van der Rohe, and Henry Ives Cobb all contributed to the campus. Gray stones pepper the campus’ English-gothic quadrangles, and students can enjoy the scenery while walking through Washington Park. The Booth School of Business features a massive steel-and-glass skylight that replicates the collegiate style in a modern way. The campus’ modern styles reflect its proximity to one of the country’s most metropolitan cities and highlights the university’s reputation as a prestigious research institution. Founded by Thomas Jefferson in 1819, the University of Virginia crafted a stunning and historic campus using the Founding Father’s blueprint. The campus’ crowning jewel remains Jefferson’s Rotunda, which is based on Rome’s Pantheon. It boasts one of the only man-made structures in the country that holds the UNESCO World Heritage Site designation. UVA’s Academical Village, conceived by Jefferson, brings faculty and students together around a shared lawn, integrating the Rotunda’s architectural beauty with the surrounding mountains. The liberal arts college in Amherst, Massachusetts, was once the second-largest college in the country. Today, students at Amherst enjoy academic excellence and beautiful grounds at a school that features a wildlife sanctuary and wetlands, ponds, and the Fort River. The campus also contains numerous buildings of the Colonial Revival style, including the 1834 President’s House, which features stately white columns and a red brick facade. Although the college only includes about 2,000 undergraduates, the 1,000-acre campus surpasses the size of many larger institutions. As a leader in reducing energy consumption, Amherst generates electricity and steam from a gas turbine and composts its food waste with a Vermont farmer. New York’s Vassar College, located in Poughkeepsie, opened as a women’s college in 1861. The 1,000 acre campus features more than 100 buildings, including Main Building, which once housed the entire college and earned a spot as a National Historic Landmark. The buttressed architecture of the Gothic Thompson Memorial Library transport visitors to the Old World, and the library features a stained glass window of Elena Cornaro Piscopia, the first woman in history to earn a doctorate. Vassar’s campus also acts as an arboretum, with hundreds of species of trees. At its founding, the college planted white oaks, elms, maples, beeches, and willows, turning its campus into a forested paradise. Pepperdine University sits on an 830-acre campus in Malibu, California, on hills overlooking the Pacific Ocean; nearly every spot on campus features stunning views of the ocean. When George Pepperdine founded the university in 1937, it was in Los Angeles; the Malibu campus opened in 1972 on formerly undeveloped ranch land. Just 35 miles northwest of Los Angeles, Pepperdine’s scenic location feels like a retreat from the modern world. The university’s Mediterranean architecture, which features white stucco, lightly tinted windows, and red tile roofs, creates a modern, California ambiance that pairs perfectly with the ocean views. Sitting on the shores of Lake Michigan in Evanston, Illinois, Northwestern University boasts on-campus beaches. The school’s tree-filled, 240-acre campus also features a mix of traditional and modern architecture, including Deering Library, which was built in the 1930s and modeled after Cambridge’s King’s College Chapel. Modern additions include the Kellogg Global Hub, home to Northwestern’s business school. Northwestern also boasts a downtown Chicago campus that sits between the lake and the famous Magnificent Mile. Gothic revival and art deco buildings dominate this campus. Its proximity to some of the most stunning buildings in the world makes Northwestern perfect for architecture lovers. Unlike many other colleges, which arrange buildings around a green or a quad, Wellesley’s master planner designed its academic structures around the natural landscape, giving it a scattered appearance that integrates the institution into its natural setting. In the fall, nature takes center stage as the trees change colors, transforming the campus. The University of Washington offers views of the Cascade mountain range and Lake Washington. The university also boasts views of houseboats and Drumheller Fountain, which dates back to the 1909 Alaska-Yukon-Pacific Exposition. The university features collegiate Gothic architecture. In spring, the University of Washington’s cherry blossoms draw visitors to the quad where thirty Yoshino cherry trees line the paths connecting the campus’s liberal arts buildings. The 703-acre campus is located in Seattle and also features a statue of George Washington standing in Red Square. The Morehead-Patterson Bell Tower stands 172 feet tall and provides panoramic views of the University of North Carolina at Chapel Hill. The 729-acre campus features botanical gardens, poplar trees, and classical architecture, such as the Old Well, a neoclassical rotunda based on a structure in the gardens of Versailles. It sits at the site of the university’s original water source, and legend claims that the fountain carries good luck for those who drink from it. UNC’s Morehead Planetarium, famous for training NASA astronauts in celestial navigation, boasts a link to the Jefferson Memorial; both were designed by the same architects. With a storied history and natural beauty, UNC stands out as one of the most beautiful campuses in the country. Although the University of Hawaii at Manoa’s architecture looks nothing like the collegiate style of ivy-covered mainland institutions, it boasts a beauty of its own. Nestled in the mouth of the Manoa Valley, the school owns the only university tropical arboretum in the country. The Lyon Arboretum showcases Hawaii’s palms, gingers, and bromeliads, making it a valuable resource for the university’s College of Tropical Agriculture. The urban campus, located in Honolulu, provides views of the city, the lush Manoa Valley, and the expansive blue ocean. The school also showcases Hawaii’s Pacific Rim connections, with a Japanese garden featuring a koi pond and teahouse, as well as a Thai open pavilion. The College of William and Mary takes its name from its royal patrons. King William and Queen Mary founded the college in 1693, making it the second-oldest in the country. The 1,200-acre campus features a variety of beautiful buildings, including the red brick Sir Christopher Wren Building, a National Historic Landmark first constructed in 1695. With William and Mary’s long history, it’s no surprise that its campus features distinct regions known as the Ancient Campus, Old Campus, and New Campus. William and Mary also boasts rolling woodlands and Lake Matoaka, which are connected by an expansive system of trails. Just outside of campus, the Williamsburg Historic District transports visitors back to the colonial era, and the college itself counts Founding Father Thomas Jefferson among its alumni. Elon University, located in central North Carolina, often appears on lists of the country’s most beautiful campuses. The 636-acre campus looks like a botanical garden, and the grounds include the Elon University Forest, which includes 56 acres of preserved land. The welcoming design of Elon’s campus reflects the institution’s history of community and culture. The campus includes seven neighborhoods, clustered around the lakes and fountains dotting campus. From the Historic Campus to The Colonnades, Elon integrates natural beauty into its landscaping, which dates back to 1889. Wake Forest University’s campus is nestled in the scenic foothills of the Blue Ridge Mountains. The trees that surround the campus provide natural beauty and take part in the university’s history. When Wake Forest was founded in 1834, the area was known as the Forest of Wake because of its foliage, which gave the institution its name. The university’s manicured landscapes highlight the beautiful buildings. Wake Forest is a short drive from the Great Smoky Mountains and the beach. Students can also stay on campus to enjoy Georgian-style architecture. When it comes to urban campuses, Brooklyn College stands above the rest. Although it sits in the country’s largest city, the college transports students and visitors into a tree-lined collegiate world. When it opened in 1937, Brooklyn College reminded visitors of Thomas Jefferson’s University of Virginia, which inspired the landscaping and Brooklyn College’s Georgian-revival buildings. Architect Randolph Evans designed a library featuring a tall tower, and in 1936 President Franklin D. Roosevelt laid the cornerstone of the college’s gymnasium. The 35-acre campus features a lily pond surrounded by red brick paths and cherry trees that bloom every spring. If the campus looks familiar, the reason lies with its appearance in Law and Order and Gossip Girl. Kenyon, a small liberal arts college in Gambier, Ohio, combines green landscapes with Gothic architecture. Its first building dates back to 1829, and like many of Kenyon’s buildings, it reflects the look of Europe’s stately colleges. The Middle Path, a mile-long stroll through classical and Gothic buildings, winds through the heart of Kenyon’s campus. The college’s Midwestern heritage contributes to its appeal, with nearly two centuries of history in Gambier. Kenyon also boasts a 380-acre nature preserve on its campus. The meandering College Creek slowly winds through Whitman College until it reaches a duck-filled habitat named Lakum Duckum. Expansive green lawns connect buildings dating back to the nineteenth century, including Whitman Memorial Building, which earned a spot on the National Historical Register of Historic Places. Whitman's Romanesque-revival style distinguishes the school from newer West Coast liberal arts colleges. The quad sits at the heart of Whitman's 117-acre campus, with Penrose Library watching over the wide field. Outside of its Walla Walla, Washington, campus, Whitman owns a number of local wheat farms as well as the Johnston Wilderness Campus, which is used for retreats. Pennsylvania’s Bryn Mawr College, which dates back to 1885, boasts a beautiful arboretum. With picturesque greens and some of the earliest examples of collegiate Gothic architecture, the school blends natural charm with man-made beauty. The women’s college harbors an ornate statue of Athena who, according to local legends, acts as patron to the students. Bryn Mawr’s 135-acre campus features College Hall and an enclosed, open courtyard called The Cloisters, which is modeled after Old World architecture. The Cloisters is a Natural Historic Landmark. The Sunken Garden hosts outdoor theater performances and weddings, and the scenic Rock Arch connects one of the many dormitories on campus with a common room. Located in the heart of Memphis, Tennessee, Rhodes College offers a step back in time with its buildings and landscape, each designed in the style of a Gothic village. In fact, thirteen of the buildings at Rhodes appear on the National Register of Historic Places. The 123-acre, wooded campus includes more than 1,500 trees, and its scenic beauty fits well with the college’s historic neighborhood near the Memphis Zoo. The core of Rhodes’s campus dates back to the 1920s. Architects Henry Hibbs and Charles Klauder used Arkansas sandstone, Vermont slate, and Indiana limestone to craft the collegiate structures. Both an idyllic wooded preserve and busy Memphis life surround the school. Nestled in the New Hampshire mountains, Dartmouth University blends natural beauty with collegiate charm. Green, rolling lawns in spring turn become snow-covered by winter. In the fall, trees stand out against the campus’s rust brick buildings. Many of the buildings date back to the 19th century, reflecting the Georgian style of the era. The Green, a massive grassy field that serves as the “emotional center” of the institution, is found in the middle of the institution. The land was once a pine forest, long before Dartmouth’s 1769 founding, and for years graduating classes celebrated by removing a stump. Just off campus, students can escape to the ski slopes or hike in the mountains. Better known as Ole Miss, the University of Mississippi started with a single square mile of land in the small town of Oxford. Today, it boasts 1,200 acres and one of the most beautiful campuses in the country, which includes its own golf course and airport. The university’s predominantly red brick buildings, supported and adorned with grand white columns, create an unparalleled and regal look. Built in the 1840s, the Lyceum serves as the crown jewel of Ole Miss; it once functioned as a hospital during the Civil War. But the buildings are only part of Ole Miss’s Southern charm. The meticulously maintained landscape and collegiate atmosphere combine to create an unforgettable college experience. Sitting atop the Del Rey Hills overlooking the vast Pacific Ocean, Loyola Marymount University boasts a view unrivaled by many institutions. The school features more than ocean views, it also provides an unforgettable panorama of the Los Angeles skyline. The private Catholic institution’s 150 acres of land span the top of the bluff, creating a platform for breathtaking views of Marina Del Rey and Playa Del Rey. Loyola Marymount features buildings from the 1920s, with many in the Modern style, including pavilion-style designs and colonnades lined with arches. Palm trees, red-tiled roofs, and white stucco, all surrounded by a spectacular vista, make Loyola Marymount an unforgettable campus. Originally located in Oxford, Georgia, Emory established its Atlanta campus in the early twentieth century in the city’s historic Druid Hills neighborhood. The campus’ classic, Georgian architecture, surrounded by towering trees and manicured laws, captures the feel of the regal South. The school’s marble buildings and fragrant flowers only add to the campus’s Southern allure. Emory’s layout, designed by architect Henry Hornbostel, integrates the maples and magnolias native to the area with a branch of the Peachtree Creek, which runs through campus. Visitors to the suburban campus feel as if they are walking through a picturesque painting. Students also enjoy the beautiful, leafy space year round thanks to Atlanta’s temperate climate. The University of California-San Diego opened its doors in 1960, welcoming its first class of students to a modernist campus that blends natural beauty with a public, art-filled expanse of more than 1,100 acres. Located in the La Jolla neighborhood, the university boasts eucalyptus groves and stunning views of the Pacific Ocean. The campus’ most recognizable and memorable building is the iconic Geisel Library, named after Dr. Seuss. The library sits at the head of a canyon and visually represents a stack of books. The Snake Path leads to the library, evoking Milton’s Paradise Lost. Geisel Library’s Brutalist architecture, designed by William Pereira, is currently featured in the university’s logo. Portland, Oregon, home to Lewis and Clark College, surrounds itself with natural beauty, including the Columbia River and the snow-capped Mount Hood. The college feels like a park, with densely packed trees and creeks. The 137-acre campus, sitting atop Palatine Hill, adjoins to the 645-acre Tryon Creek State Natural Area. The green forests transform Lewis and Clark into a magical escape, creating a tranquil, lush environment. The scenic environment marries well with the college’s mission. Lewis and Clark built a reputation as one of America’s greenest institutions, and 100% of the university’s electricity comes through sustainable wind power. Greenville, South Carolina, home to Furman University, sits at the foothills of the Blue Ridge Mountains. The campus, often heralded for its collegiate architecture and landscape design, combines manicured lawns and Georgian-style buildings. Other notable scenic inclusions, like the tranquil Asian Garden with a Buddhist temple imported from Japan, contribute to the picturesque feel of Furman. Because students spend so much time on campus, the need for a modern campus that will be student-friendly has never been more important. Students living on campus expect dorm rooms that are modern and up-to-date, providing necessary wiring for computers and other technological gadgets. The key for many colleges with older campus buildings is to implement needed updates while maintaining the look and feel of tradition. Universities such as Yale, Duke and Northwestern are wonderful examples of schools combining today's needs with yesterday's traditions, creating an environment that will please their students while keeping those who love the "old-school" feel happy as well. A beautiful college campus can have a big impact on students and their learning experiences. As environmental issues become more important to students, colleges are re-shaping their campuses to meet the needs of the environment. Many universities are updating buildings and "going green." Schools such as Rice University are re-designing campus to create more green space for students, and buildings such as Duncan Hall and several new dorms are installing more efficient lighting and power sources. Other schools are making classrooms more student-friendly with better seating and lighting. Gone are old desks and hard chairs, replaced with tables for groups complete with padded chairs. Many colleges are limiting class sizes, enabling them to have classrooms that are less crowded in an attempt to create learning environments emphasizing personal instruction. Students who report having better learning experiences due in part to a well-kept campus say they like a combination of old and new. Campuses with lots of outdooor areas for students to congregate tend to be rated very high, as are those which have modern facilities for lab work and research. Modern research buildings that give students the best tools to work with make a big impression on students and how they view their learning experience. However, despite all the new buildings and gadgets, it's still location, location, location when it comes to beautiful campuses. Schools in warm-weather states like California or Florida usually top the list of favorite campuses of students. Rollins College, outside of Orlando, boasts stunning architecture coupled with sunny skies to create a favorite college campus. Students there even get a day off to enjoy their surroundings even more. Called "Fox Day," students are encouraged to take the day off and enjoy the local community along with their campus. Others like Whitman College, located in the place so nice they named it twice, Walla Walla, Washington, is also a student favorite. The campus offers students hiking trails, streams and outdoor sculptures to enhance their learning experience, along with a nature preserve used for research projects. When prospective students are deciding which schools to visit, there are some things to keep in mind. First is giving thought to what type of environment will they be most comfortable with? Do they prefer a warm-weather climate like Florida or California, or are they okay in a northern location like Minnesota or Maine? Do they want a campus with lots of open fields or wooded areas, or do they prefer the beach to be next door to their dorm? Do they like the hustle and bustle of a big city, or would they prefer a more rural location for their studies? All of these questions come into play when deciding on a college. When on a campus visit, spend the day walking around and getting a feel for it. Visit classrooms, labs, research facilities, athletic stadiums and other places. Look over the buildings that house classrooms of your major. This will give you an idea of how important the college views that department. If facilities are not to your liking, it may be better to look at other schools. Ivy League schools and others have done remarkable work with their campuses, updating to meet today's needs while maintaining their historical architecture and style. If environmental issues are important to you, find out about the school's sustainability program. Colleges such as Sonoma State University have set the standard for colleges across the country, using recycled rubber and glass to help construct campus buildings. Take your time and look around, because like people colleges don't get a second chance to make a first impression. To create this list, we examined college location, styles of architecture seen on campus, and whether the campus includes any famous landmarks. When considering location, we placed less value on convenience and more value on scenic locales. Many of the colleges on this list attract more than just students to their campuses and were designed by famous architects, which help them stand out. Some campus landmarks bring in tourists and add to the beauty of the school. Click through for a full review of our Rankings Methodology.